roots of unbolted young plants in autumn are edible raw but may cause gas. roots are best when boiled or roasted. roots contains the starch inulin, which breaks down into a sugar when cooked. cooked roots can be dried and ground to flour. stems and leaves are edible raw, after peeling to remove prickles. immature flowerheads are edible raw, but best when steamed. 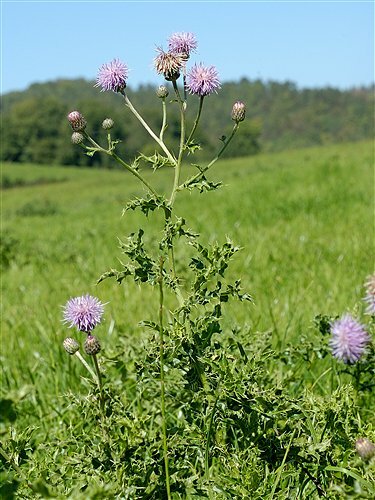 varieties in Ontario are Canada/creeping thistle (Cirsium arvense) and Bull thistle (Cirsium vulgare). grows across wide range, in plains, foothills, montane, and subalpine regions. warning: eat in moderation, some thistles are carcinogenic. Thistle plants seem to be everywhere, and can grow to impressive size along sideroads. There are a number of different species of thistles on the west coast, including bull thistle, canadian thistle, and milk thistle. The various species have the same edibility characteristics. The stem is the easiest part of the plant to collect. Use a knife to collect the top third of the plant and discard the rest, which becomes progressively more stringy especially in larger plants. Slice off the thorny leaves, and place the stalk in a bag until cooking time. When ready to use, remove any remaining thorns from the stalk, and cook as you would with celery. I find it's best to cut the stalk into finger-long sections just before cooking it, since the exposed parts turn an unappealing brown color if left sitting. When cooked in soup, it has a taste and consistency similar to celery.